This year, more than any other, I’ve seen a ton of talk in the fantasy universe about consistency. The thought is, in my opinion, right on the money. Point-per-game averages don’t really tell the whole story. For instance, if a guy scores 0 and 30 points over a two week span, and another guy scores 15 points in each of those two weeks, then they’ll both have the same points-per-game average (15) during that span. It’s clear, however, that their impact on your fantasy team will be much, much different. I seemed to focus a lot of attention on the three wide receivers this season: AJ Green, Julio Jones and Dez Bryant. While each of them, I would imagine, will be top-five wide receivers in 2013, I think they’re very different types of players and each pose various levels of risk. 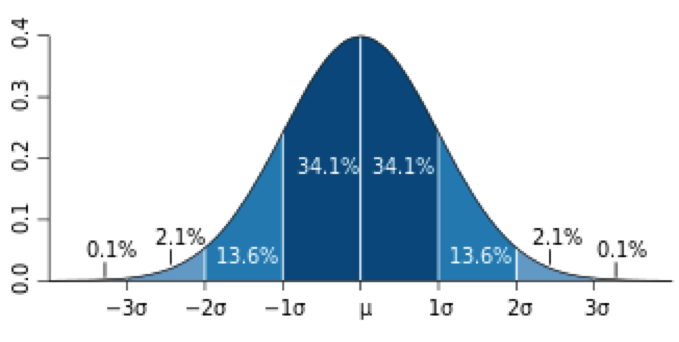 Risk is something that we want to avoid in fantasy football, and one way to do this is by analyzing the statistical measure called standard deviation (SD). What SD does is take the average of a set of data point (called expected value, or what you would expect from an average game) and measure how far the individual data points (individual games) spread across the sample. You then get a “standard deviation” represented by sigma (the small o below) which I’ll refer as “O” throughout the article. The benefit of standard deviation is that you can find simple variances in a set of data. Within one standard deviation – either forwards or backwards – you can expect to find 68% of the data points analyzed. Between two standard deviations, you can find over 95% of data points. For fantasy football, the smaller the standard deviation, the less variation there is from one game to another. That means if a player has a small standard deviation, he’s more prone to score his expected value (average), or be more consistent each week. The higher the standard deviation, the more loosely-packed the data points are. That means the player is more boom or bust, as long as his “boom” is worthwhile. I analyzed Green, Bryant and Jones over the last two seasons for this particular analysis (which might favor Dez Bryant since he was not a rookie last year). The reason the last two seasons were used was because I needed more data points to make running the numbers more accurate. So, with all that being said, let’s take a look at AJ Green, Julio Jones, Dez Bryant and their consistency using standard deviation. I’ve lauded AJ Green all throughout 2012. This past season, Green had an absolutely remarkable set of games, scoring at least one touchdown in each game between Week 2 and Week 11. Click here to see the two-season data on AJ Green. Over this span, Green averaged just under 11 points per contest. However, his standard deviation was higher than I initially expected (until I did Jones’ and Bryant’s analysis), sitting at 5.79. In other words, essentially that about 70% of Green’s games fell between roughly 5 and 16 points. Green will be drafted just after Megatron in 2013, and it makes sense. I do think, however, fantasy owners need to be aware that Green still has inconsistencies – more than likely ones that are inherent within the wide receiver position – in his week-to-week production. I know that the discussion around Green will be just how consistent he is, so you might have a leg up if you don’t buy into that all the way. But as we’ll see – he’s more consistent than some of his top-tiered contemporaries. Confession: In my major keeper league I drafted Jones as a rookie, and kept him as a sophomore, and I’ll surely be keeping him as a junior. However, I have dealt with remarkable frustration dealing with Jones, and his performance was actually the impetus for this article. Jones, I feel, is the darling of total points scored. Despite leaving some games early, Jones finished as a top 10 wide receiver in total points scored this season, but this tally doesn’t tell his entire 2012 story. Click here to see the two-season data on Julio Jones. Jones actually averaged less points per game played than AJ Green (10.8 to 10.9) over the last two seasons, but what’s more telling is that Jones’ standard deviation was at 7.76 – two points higher than AJ Green. That means Jones, 68% of the time, would be expected to score between 3 and 18 points. Yes, the ceiling is higher, but the floor for Jones’ is also pretty low. And I think owning Jones week-to-week gives you a really good sense of that. Jones’ talent and overall season numbers will sucker owners in, but week-to-week, Jones is not as dependable. In thinking about the game more on a week-to-week level, I think Jones’ value might start to take a hit. He’s still valuable, but in the top 5, splitting hairs is a necessary practice. With Gonzalez expected to retire, I also wonder exactly how Jones will respond if defenses can key in on him more. We’ve seen teams be able to totally shut Jones down. I do have some concern that that’s going to happen a lot more in 2013. Another confession: I am not a Dez Bryant guy. I was probably the last hanger on to the anti-Dez bandwagon. I felt that he was insanely athletic, but I’ve seen enough athletic guys come and go with my Oakland Raiders to not buy into that all the way. I think he looks good in a uniform, and can make insanely athletic plays, but I am not sure he will ever just “get it”. Click here to see the two-season data on Dez Bryant. Dez was the biggest question mark for me going into this little experiment, and I had no idea how consistent or inconsistent he really was. Bryant was actually the highest scorer on the year of these three, squeaking by AJ Green by 7 more points scored. Dez, over the last two years, had the highest average of our players profiled here at 11.06 points per game. He also had a slightly lower standard deviation compared to Julio Jones, at 7.5 points. We can estimate that Bryant will score between about 3.5 points and 18.5 points per game about 68% of the time. This illustrates why Green would be higher ranked, despite worse total-season numbers. Dez is strikingly similar to Julio Jones. I might be more inclined to desire and covet Dez considerably more than I do Julio, though the numbers look the same. Over the last 8 games Dez played, he averaged 17.9 points per, with a standard deviation of 9.1. At that pace you could expect 68% of his games to be between a remarkable 8.7 points and 26.9 points per game. Is it possible that he keeps up at that pace? If he finally “got it” and a light switch flipped on his head – potentially. But I would still worry about the consistency. I think current mock drafts probably have it about right. Right now, FantasyFootballCalculator.com has Green going in the first round. That’s pretty high, but I think it represents a movement of fantasy owners are making towards consistency. I’ve previously written about how inconsistent rankings for wide receivers have historically been, and given Green’s dependency, people will gravitate towards his reliable value. While his true dependability may not be what owners expect to see at first glance, it’s significantly better than that of Jones and Bryant, two guys going in the same area of 2013 fantasy drafts. I am extremely excited to watch these young, explosive receivers develop. But from a fantasy perspective, Green is your guy right now. Yes, the ceiling is lower than some other guys out there…but the floor is higher, too. And, ultimately, early draft choices should be made on the guys that can play and won’t kill your weekly chances. You run that risk more significantly with both Jones and Bryant.